In the last three days, Geneva hosted five important watch auctions from some of the most renowned auctioneers of collectible timepieces. In total, these auctions sold timepieces for the amount of more than 60 million Swiss Francs which gives a good idea of the level of interest around vintage wristwatches. Several new records were set. 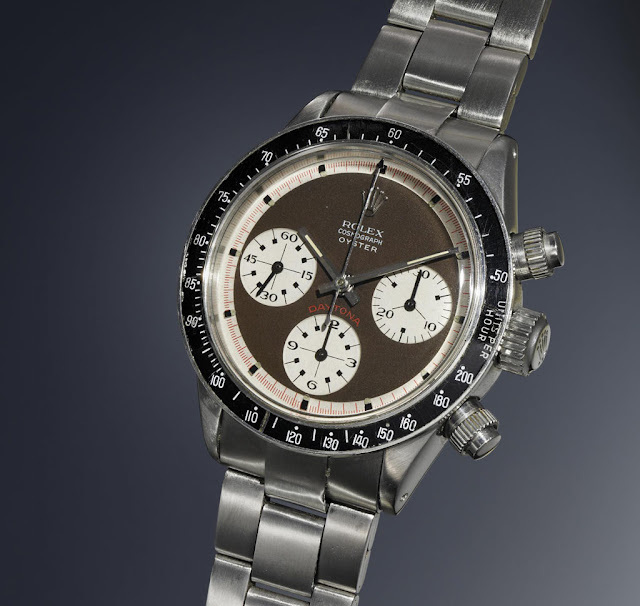 Sotheby’s Important Watches opened on Saturday May 14 with 267 lots which drove the total of the auction to more than 4 million Swiss Francs. The lot 212, a very rare stainless steel Patek Philippe wristwatch with black dial and Breguet numerals, reference 1504, soared to more than ten times its pre-sale estimate, reaching Swiss Francs 328,000. The Reference 1504 was produced during a few years only, between 1941 and 1944. Until today, only four examples of this reference in stainless steel are known. A yellow gold Heuer Carrera chronometer, Calibre 12 Manufacture, with date, and once owned by Swedish Formula One driver Ronnie Peterson, went for Swiss Francs 225,000, which represents a new record for a Heuer timepiece at auction. The watch was a gift by Jack Heuer to Peterson in 1972 to commemorate the Prix Rouge et Blanc Joseph Siffert award that Ronnie Peterson won for his performance at the 1972 German Grand Prix at Nürburgring. On May 14, Phillips offered 88 stainless steel chronographs in the Start-Stop-Reset: 88 Epic Stainless Steel Chronographs dedicated auction which, despite the small number of lots, realised more than 16 million Swiss Francs with the six top lots alone totalling nearly 8 million Swiss Francs. The star of the auction was, without doubts, the Rolex 4113 split-seconds chronograph in stainless steel produced in 1942 (lot 56). Only twelve examples of this reference were manufactured, all of them housed in a large 44 mm steel case. 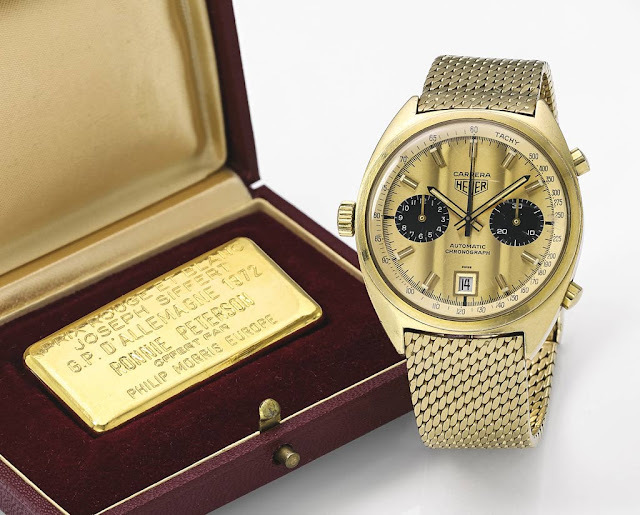 The previous two appearances of a reference 4113 at auction resulted in a then new world record for a Rolex watch selling publicly. This happened a third consecutive time with this example which was sold for the amount of Swiss Francs 2,405,000 (the initial estimate was Swiss Francs 800,000 - 1,600,000). According to Phillips, Rolex never offered this model directly to the public for sale. Instead, it was produced for a selected group of racing teams and their drivers. A rare Rolex Cosmograph Daytona "Paul Newman Oyster Sotto" reference 6263 (lot 31), stamped inside caseback 6239, powered by a manual movement Valjoux 727 and produced in 1969 was sold for Swiss Francs 1,985,500 (the estimate was Swiss Francs 750,000 - 1,500,000), a new record for a Rolex Daytona. This example is one of only two such known Tropical "Oyster Sotto", having aged beautifully to a uniform shade of chocolate brown. The Italian nickname of "Oyster Sotto" for the dial, translating to "Oyster Underneath", was due to the placement of the "Oyster" designation beneath the word "Cosmograph" at 12 o’clock. These are the very first Paul Newman-style dials made for Oyster-cased Daytonas, whose screw-down pushers permitted greater water resistance compared with the pump pushers of earlier generation models. 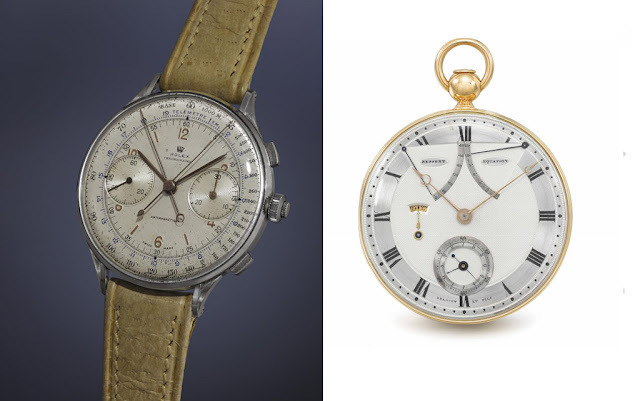 The Geneva Watch Auction: Three held by Phillips on 15 May 2016 also realised more than 16 million Swiss Francs with three lots exceeding 1 million Swiss Francs. 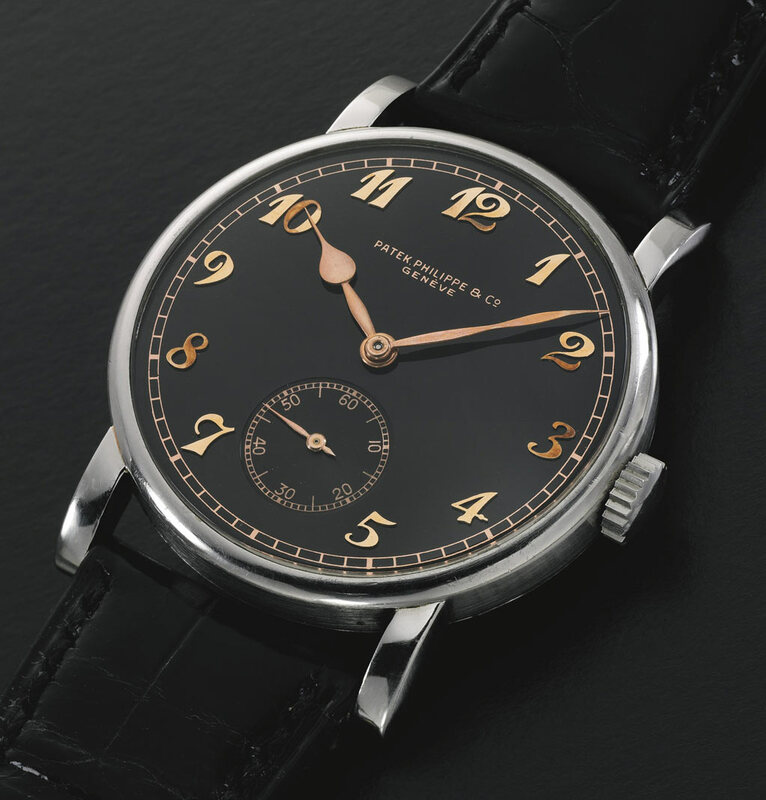 The Lot 135, a Patek Philippe Calatrava reference 530 produced in 1941 and presented in virtually unworn conditions, had an estimate in the Swiss Francs 300,000 - 600,000 range but it sold for the amount of Swiss Francs 1,445,000. Housed in a stainless steel 36.5 mm case, this watch is fitted with a black dial adorned with Breguet numerals and, according to Phillips, it is the only one of its kind to exist in the world, something which could explain the exceptional result. Rarity and conditions can, in part, explain the huge price difference compared to the Patek Philippe Reference 1504 sold at Sotherby’s the day earlier (see above). Both watches were produced in the same year in stainless steel cases framing black dials with Breguet numerals and housing similar movements. 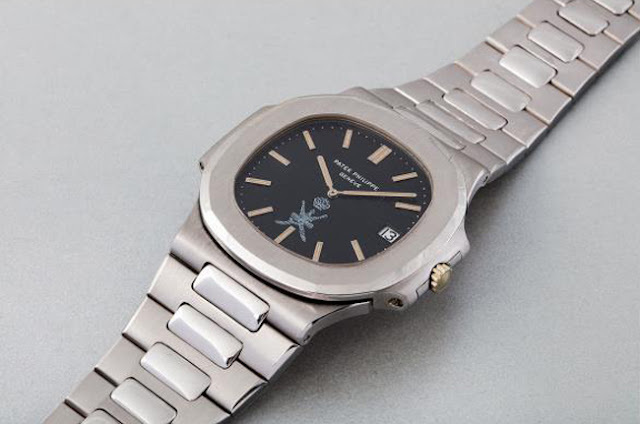 The Patek Philippe Jumbo Nautilus Oman reference 3700/1 in white gold produced in 1978 sets a new record for any Patek Philippe Nautilus 3700 realising Swiss Francs 635,000. Made on special commission for Sultan Qaboos bin Said al Said, the watch is one of less than 10 white gold examples to have appeared at auction since the model’s original launch in 1976. The same day, Antiquorum presented 478 lots including a truly unique selection of pocket watches from several leading brands at the Important Modern and Vintage Timepieces auction. The Urban Jurgensen "Commander Krusenstern" chronometer with Arnold spring detent escapement (lot 84) created in 1812 achieved an exceptional result being sold at Swiss Francs 620,000 starting from an estimate of Swiss Francs 30,000 - 50,000! The famous Russian astronomer Councillor of State Shubert wrote about this chronometer, in the journal of the Imperial Academy of Sciences in Saint-Petersburg: "….Mr. 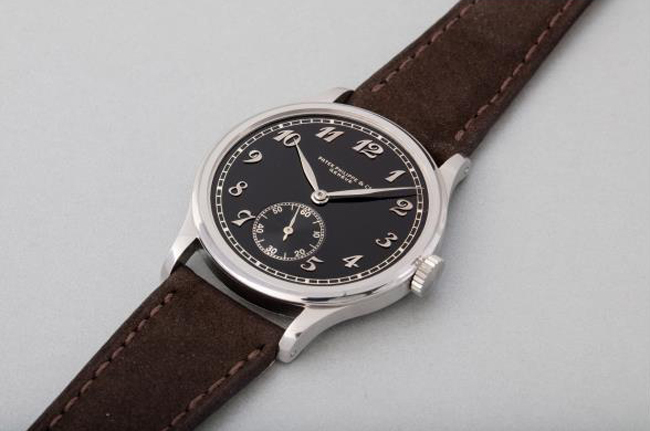 Urban Jurgensen in Copenhagen constructs chronometers which are equal to the best English ones. 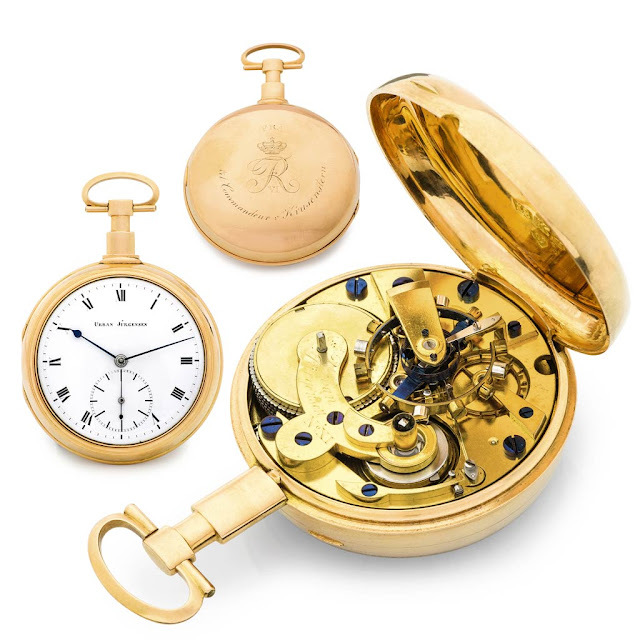 One of these chronometers in gold, which the King of Denmark commissioned from Urban Jurgensen to be presented to the first person in Russia to sail around the world, Commander Krusenstern, bears the engraving: from Frederik VI to Commander Von Krusenstern. Its rate was tested for over a month by our observatory at the Imperial Academy of Sciences. In the trials, the chronometer's precision was found to be so excellent that only few chronometers could be placed on a par with it." Finally, Christie’s Rare Watches Including Important Private Collections featured 273 lots from three important private collections realising more than 18 million Swiss Francs. 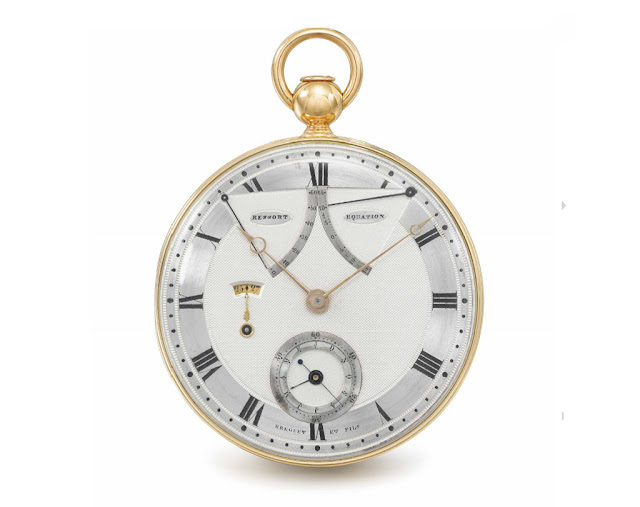 Not a surprise, the top lot was the exceptional and historically important lot 123, the Breguet No. 217 "montre perpétuelle à répétition à quantième de mois et dates et équation, échappement libre à ancre", a gold self-winding à toc quarter repeating lever watch with sectoral equation of time, day and month calendar and sectoral power-reserve indication. Signed Breguet et Fils, it was sold in Germinal an 8 (1800) to Général Moreau for the sum of 3,600 Francs, then resold to Charles-Louis Havas, founder of Agence France-Presse (AFP) in 1817 for 4,800 Francs. The estimate of this unique timepiece was Swiss Francs 600,000 - 1,200,000 but it was sold for the impressive amount of Swiss Francs 3,245,000. 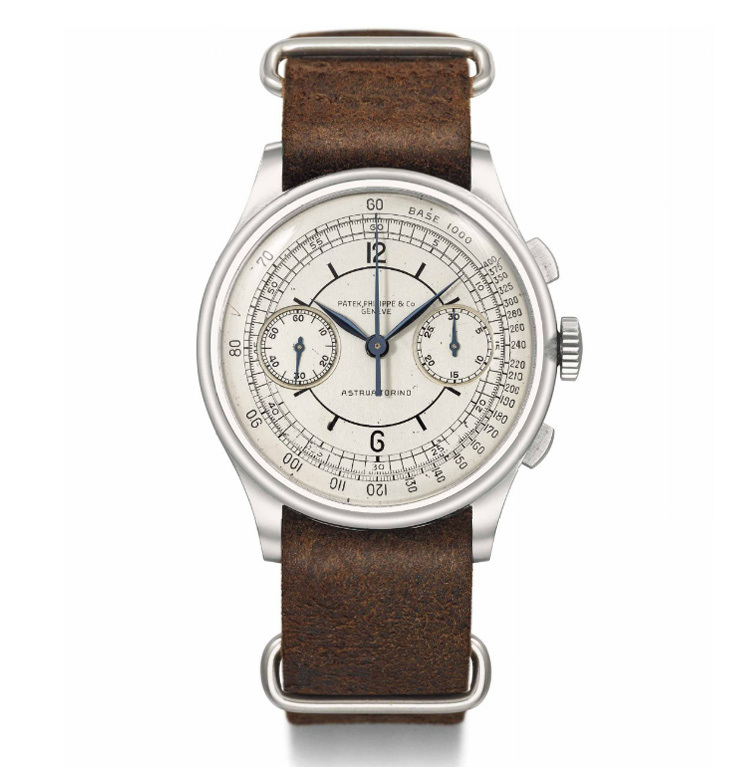 Another remarkable lot was the number 171, a Patek Philippe chronograph wristwatch reference 530 in staybrite stainless steel (36.5 mm) with a surprisingly well-preserved sector dial, manufactured in 1938 and retailed by Astrua Torino in 1939. The watch is fitted with the Patek Philippe calibre 13’’’130 movement, the ébauche by Valjoux with 23 jewels and eight timing adjustments. It is recognised by many collectors as one of the best manually wound chronograph movement made in the mid-20th century. Starting from an estimate of Swiss Francs 500,000 - 800,000, this lot was sold at the price of Swiss Francs 1,205,000. My feeling is that these prices are nuts. The Daytona is a piece of steel with a standard industrial movement. I can understand some timepieces that are part of the history of a brand and that are truly rare or unique but, for the rest, most prices are inflated. In the last three days, Geneva hosted five important watch auctions from some of the most renowned auctioneers of collectible timepieces. 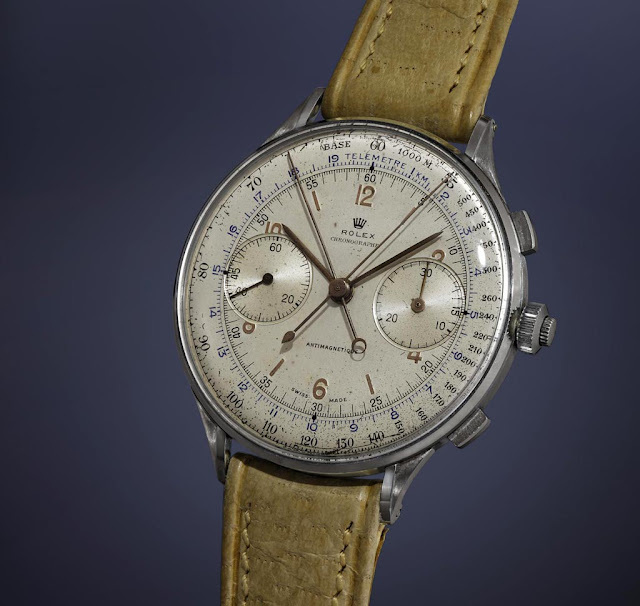 In total, these auctions sold timepieces for the amount of more than 60 million Swiss Francs which gives a good idea of the level of interest around vintage wristwatches. A yellow gold Heuer Carrera chronometer, Calibre 12 Manufacture, once owned by Swedish Formula One driver Ronnie Peterson, went for Swiss Francs 225,000, a new record for a Heuer timepiece at auction. The star of the auction was, without doubts, the Rolex 4113 split-seconds chronograph in stainless steel produced in 1942 (lot 56). Antiquorum: The Urban Jurgensen “Commander Krusenstern” chronometer (lot 84) created in 1812 achieved an exceptional reult being sold at Swiss Francs 620,000! At Christie’s Rare Watches Including Important Private Collections the top lot was the exceptional and historically important lot 123, the Breguet No. 217 which was sold for the impressive amount of Swiss Francs 3,245,000.